OK, I'm finishing this column just before y2k and my "Guide to the 21st Century" compliments of Newsweek has just arrived. Toward the back there is Steven Levy's article "It's Time to Turn the Last Page." His article is about e-books, digital bits injected into handheld devices with ultrasharp displays. Toward the beginning of the article he says, "Still, when Y3K pundits look back on our time, they'll remember it as the Last Century of the Book." I think he's right but he does leave himself a lot of wiggle room since Y3K is thousand years into the future. I actually think he is right less for what he says than for the fact that I have never seen a book of any shape on Star Trek. I can't imagine space ships with loads of paper pulp any more than I can imagine space ships with clay tablets, 8 tracks or long playing vinal. But, I also can't imagine space ships without ooddles of words in some fashion informing decisions and entertaining late at night. Supposedly Homer didn't do much writing either but there are all sorts of books attributed to him in my public library. So the book is either dead or seriously dying and may be interned somewhere in the next thousand years. So what. We are alive today, our job is teaching and we have kids wild with life who love being virtual and real at the same time; for whom being just digital is the same as being dead. I teach undergraduates at Indiana University and it is very obvious that for many of them nothing is more deadly than having to read anything in print. They don't read papers, they don't read magazines and they rarely pick up a book for entertainment. So how can the book or print have meaning for kids today? I teach in the department of Telecommunications at Indiana University. Telecom shares a wall with the department of Fine Arts which means I wander around Fine Arts a lot. 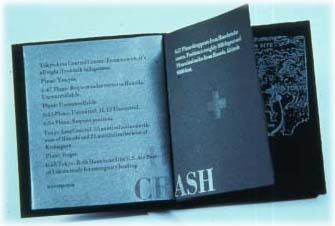 Inside the department of Fine Arts is a true wild man of bookmaking, Amos Paul Kennedy, jr. Before Amos went back to school for his MFA in graphic design and bookmaking he worked as a C programmer for AT&T. To my mind this is an odd combination so I decided to ask Amos why he made books and why kids would be interested in books in the year Y2K. Amos thought this was pretty funny and in his usual Yoda-like manner responded: Caren Heft ... you need to talk to Caren. Eventually Amos explained who Caren Heft is and how I might be able to reach her. I expected an email but got a phone number. I called Caren up and explained that I designed newMedia and I write a column called cafeTechnos and I'd like to ask her some questions about bookmaking in the new millenium. Just like Amos, Caren thought this was pretty funny. She thought it was even funnier when I asked if I could email her the questions. Caren said she didn't have email but did have a fax machine so I could fax her the questions and she'd try to create a package of information to explain who she is, what she does and why it is important in the year Y2K. 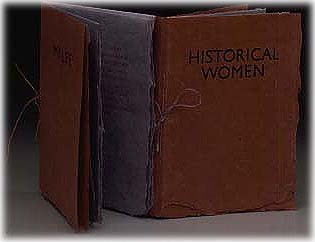 How, why and when did you get involved in bookmaking? 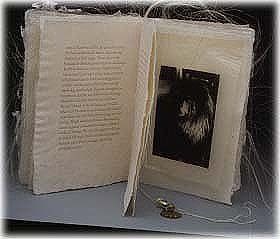 When I went back to school in the early 80s to finish my degrees, I realized that I was making all of my art work into books -- chopping up paintings, embroidering on screen to make books, making paper for book-like objects, encasing existing books in a variety of materials, making stuff with words. In frustration at not being able to get words into my books, I found Walter Hamady at UW-Madison. I enrolled in two graduate schools at once -- there is reciprocity in the UW system, commuting 200 miles twice a week with children in the house. In one semester at Madison I learned enough to know that the reason I was on earth was to make books. I have been making books since. The books I make are designed from an original text. I design the book, make the paper, set the type, print each page, bind the edition and sell the book. My work is in collections world-wide. What is a book to you? Walter Hamady's definition of a book, roughly, a series of consecutive planes, is the one I keep returning to. A personal definition would take into account my childhood, in which I was an only kid in Chicago who talked funny ( with a southern accent ), and that I could take the street car and bus and go by myself to the Austin Public Library. In Florida we had lived on an isolated farm. I became a bibliomaniac. My family did not own books, except for a 14 volume encyclopedia (which one brother and I read completely by the end of high school), poetry, history and technical books. Books became a life line for me. Making books is what I am, what I do. As Walter said, I make books because I can not make books. Why would such an old, almost antiquated art be important in the year 2000? As the world becomes more technical, people need to have something to touch and feel. Fine press books will probably become more important as book production slows. It is an art form like no other as books require that you touch them. With the Women's Art Movement of the 1960s and 1970s, books become the medium of choice for a number of artists. Books can be an immediate method of self expression, can be made in a limited space and can offer children a multi sensory learning experience. Books are power symbols in our society still. To make a book is to experience ,a portion of that power. There is an excitement in craftsmanship that cannot be equaled (for me at least) by anything with a computer. I can feel the texture of the pages and the physical weight of the book, the words resound in my ears, the visuals absorb my eyes while my brain clicks off information. 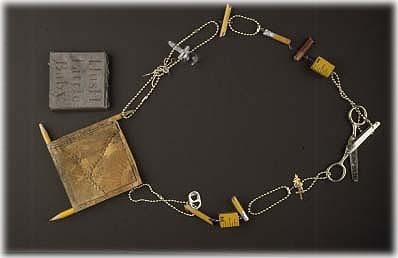 Can kids today connect to the art of bookmaking? Yes. To make a book in which the form reflects one's own text, to complete a successful project, to experience a multi sensory learning activity, to learn in an alternative way, is important to the development of a child. It is my premise that a child who cuts out fault block mountain shaped pages and writes how a fault block mountain was formed on those pages will retain that knowledge far longer than a child who looks at a picture in a book. The art of book making takes learning into a different sphere. What skills are involved in book making? What is the future of bookmaking? Limitless. Fine press books will be produced by fanatics such as Amos Paul Kennedy and myself.. Children will continue to learn better by having hands-on involvement in bookmaking. People will continue to want to hold and read books. 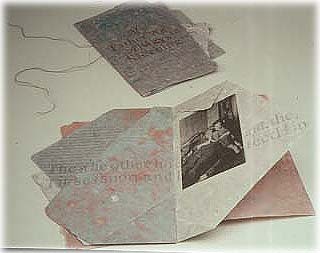 Handmade books are extraordinarily seductive. My own press focuses on stories of people whose words and lives would not otherwise be recorded, oral histories. Perhaps my most famous book is the Life and Poems of Osceola Mays. Mays is an octogenarian, East texas woman whose made up poems when she was a child. In order to save her poems, she had to memorize them as the family had only one pencil which was saved for school. Thus, she became part of the oral tradition in this country. When her grandmother was teaching her to do the laundry, in an iron kettle over an open fire, she told her grandmother that she didn't really need to learn this as she was to be a teacher. Of course, she never had the opportunity to become a teacher and spent most of her life in domestic service, doing other people's laundry. She named herself -- as she tells it, "... in those days they didn't name the children. I was called "Good Nell" after a little white girl down in town because I was a good girl. I didn't want to carry a little white girl's name..." She named herself after an Indian man who camped near her parent's farm. 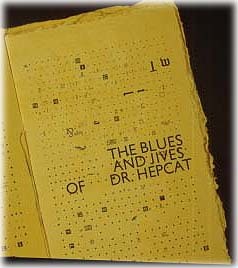 This book was printed in an edition of 75. After it was published, Osceola was invited to perform in Florence and Paris -- she performs her poems and sings the spirituals she has always sung -- she sings in the choir at the Good Street Baptist Church in Dallas. The book has been read on Public Radio in Chicago. A historical fact of media is that nothing dies out immediately. Photography did not kill painting, theater did not die because of film, radio did not die because of television and the book isn't going to die because of the internet. Painting was changed by photography, theater was changed by film, radio was changed by television and the book is being changed by the internet. Change is constant and change is unstoppable after all we aren't called homo faber for nothing. We are hardwired to create tool after tool but just because the air hammer exists we don't throw away our ballpeen hammers. The same goes for kids and learning. Computers are here and they are great tools but bookmaking with handmade paper and handset type is a deep way of understanding ourselves and our experiences with the world. About 10 years ago IBM had a very successful program for teaching kids to read and write. This program was called 'Writing to Read.' The illusion of this program was that it was successful because of the IBM PC jr. The reality was that the program was successful because IBM created the right way to teach kids reading and writing. The 'Writing to Read' program had multiple work stations which ranged from crayons to typewriters to computers. The computers were not enough then and they are not enough now. Caren Heft's book making is a deep way of knowing. It is a real way of knowing which compliments the virtual. For many kids it is a critical way of knowing. Art Works! Prevention Programs for Youth & Communities.